I'm following Hal Higdon's Novice 8K Training Plan, and my goal was to follow it right to the letter. I want to see if doing the cross training and strength training along with the running will help me not to just drop weight, but to feel better. Hopefully help my mood, and especially my back pain (which has been the worst it's ever been). 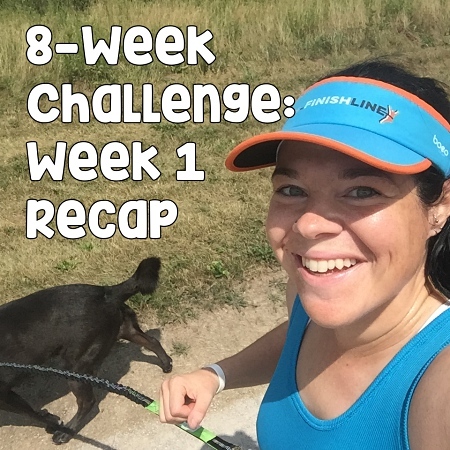 I chose this plan because it's not super difficult--especially after other plans I've done in the past (Hansons Marathon Method, training for my 10K PR, etc.). Because I've gotten so far behind on everything in general (gaining weight, losing 90% of my fitness, losing the ability to eat intuitively, emotions all over the place), I've been feeling really down about myself. I've lost my confidence and I've been dealing with major bipolar mood shifts. Basically, I want to see if this plan will make me FEEL BETTER. 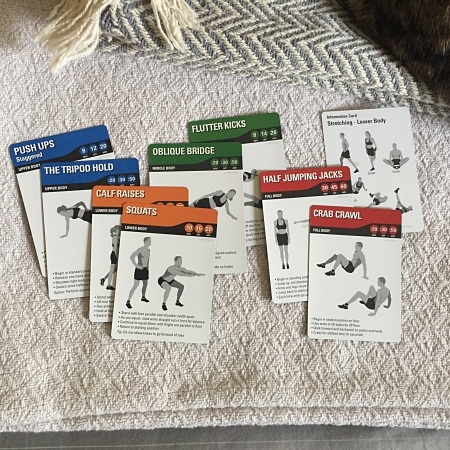 Then I did 12 stretches with a 20 second hold for each stretch. The workout doesn't look difficult, but for being as out of shape as I am, it was challenging! And I was sore the next day. However, I actually really enjoyed it. It was fun to do something different, and knowing it wasn't going to take me an hour or more to do it made me not dread it. In fact, I looked forward to the next session! 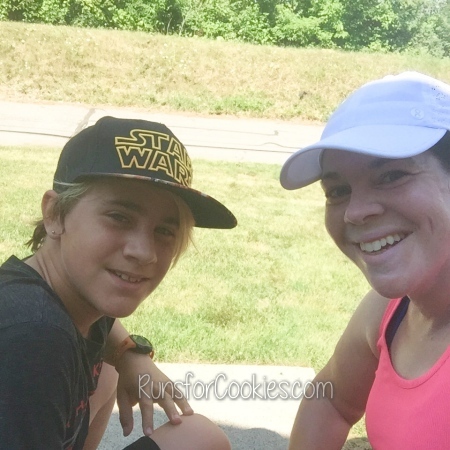 I did a two-mile run, and was excited that Eli agreed to come with me! It was super hot outside, and I think that was a bit much for him. But he immediately went faster than I wanted to, and I didn't even want to try to catch up. But I pushed my pace a little to not fall super far behind. The second mile, though, he was really struggling. He said that his back was hurting (I hope to God he doesn't have back issues like me), so he did a run/walk to finish. I just did a steady run, but tried to stay fairly close to him. We finished two miles, and we were both sweaty beasts afterward. You can see where all the brown is on the route, and that's where Eli was struggling. I was really glad that Higdon's plan doesn't require cross training to be very intense. He considers it a recovery workout, so it should be something easy--even walking! And that's what I chose to do. I took Joey for a walk to my parents house and let him play in the lake, and then walked home. I think it was about 35 minutes of walking time. This is where I got confused, and thought it was a rest day. So, I just took Day 4 as my rest day and then did the workout on Day 5 instead. 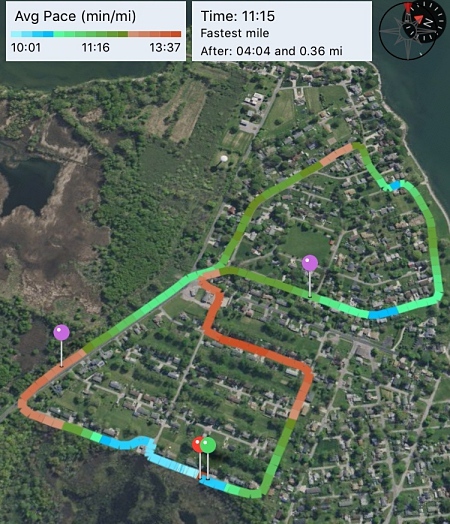 This was a 2-mile easy run AND stretch and strengthen. I was kind of dreading this run for some reason, so to make it fun, I took Eli and his friend to the park to fish while I ran the perimeter (with Joey). I already explained this on the last post, so I won't get into it again. But here is my nerdy run path anyway. 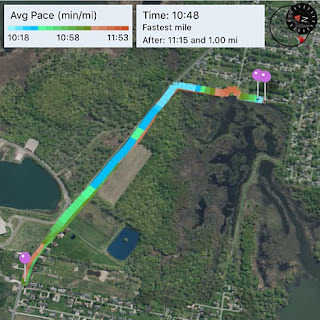 Because Joey was WAY too excited to be in a new place with tons of people around, our fastest mile was from the very second I hit "start" on my Garmin (that's where all the light blue is). Between the running and the pulling on the leash (I was wearing the hand's free leash, but it has elastic, and I was literally afraid he'd break it because he was pulling so hard). He calmed down once we got past all the people, but he was still wanting to go faster than I'd have liked. He was thrilled to cool off in the pond when we were done. As soon as I got home, I did the stretch and strengthen part of the workout. I did the same thing that I did on Day 1, only I used cards I hadn't used yet. And then I did the 12 stretches for 20 seconds each. This was 30 minutes of cross training. I already knew that I wanted to ride my bike, and I planned to do it in the evening when it cooled off. I was trying to figure out what to make for dinner (Jerry has been on a solo-vacation for a few days--a 1200 mile road trip!--so it's just been the kids and me for dinner), and I had a fun idea. I asked the kids if they'd want to ride their bikes with me to Subway, where we could eat and then ride home. They were super excited about it! I was nervous about them riding on the busy roads, but I thought it would be a good opportunity to teach them the rules of the roads and right-of-ways and all that. It was a little stressful at a couple of spots, but most of the time, it went well. I had forgotten that it was about 5.5 miles to Subway, so it was 11 miles round trip. I think that's the farthest the kids had ever ridden before! So we each got a footlong sub. I ate about 3/4 of mine. But it was one of the best that I'd ever had--she really stuffed the veggies in there! I get it with everything except for tomatoes and spinach. 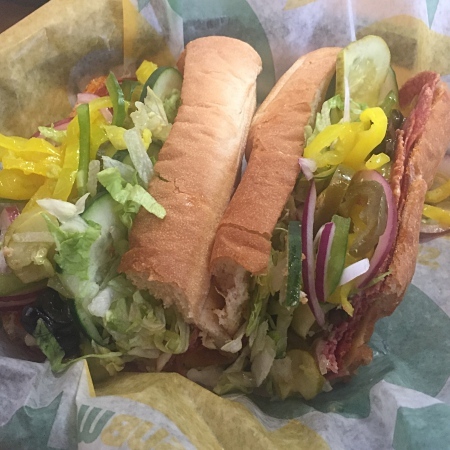 And always extra banana peppers! After I finished the drawing, I was surprised at how much time had past. So, I decided to get my running clothes on and head out before I could even procrastinate. I just did a very simple out and back. I listened to a new podcast, and actually didn't even think about my pace at ALL. It wasn't until I stopped my Garmin that I saw my pace was faster than I expected. Whew! That was a lot of recap! As far as my diet goes, I haven't been doing great. My plan was to count calories, but I am still having a really hard time transitioning back to doing that. My emotions are still out of whack, and emotional eating gets the best of me sometimes. If I can cut back on the emotional eating this week, hopefully I'll see some good progress next week and I'll post a weigh-in. For now, I'm just going to keep trying! But in the meantime, I'm still following the Higdon plan. Seven weeks to go! 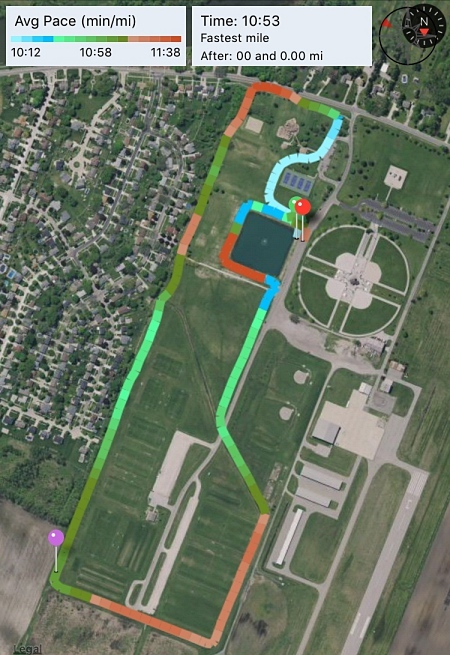 What running app is that? So interesting! Oh, I forgot to link to it! It's called Connect Stats. What a successful first week!!!!! What's the name of the running app? I'm a new reader to your blog and I'm really enjoying it. It is helpful to me to know I'm not alone in the struggle, especially with food. I've recently lost 40 pounds (40 more to go) and I have had to change the way I feel about leaving something on my plate and about the "more food for less money" mentality. Now I think "Either way, I'm paying for the food so I'm going to waste it instead of waist it." (And it is really not wasting the food if you only order what you need to eat, or take it home for another meal - or just throw it out. It is a matter of our health!). Good luck with your journey! What's the running app? That looks cool. I enjoyed your recap! I don't see where you named that app...it IS very interesting to look at the data. And the colors, lol! Subway is a business. Businesses are in business to make money. We are in charge of our own lives. Only we can choose what goes in our mouths. I HATE the temptations! Unfortunately, they are everywhere. The Spicy Italian is my fav too! Way to go sticking to your plan. I've been in a mood rut lately as well. I've maintained my running and exercise but have been eating my emotions. Let's kick this together! I'm curious what is the name of that app? Does it just get the information from Garmin connect? Oh, I forgot to link to it! It's called Connect Stats. And yes, it just pulls the info from Garmin Connect. I just love that it shows so much more detail! The app must be iOS only? Which app is that for running? Looks great! So happy to see you and the boys all wearing helmets!! !